One of the biggest reasons that Google is ruling the world is its simplicity and innovative approach to deal with the consumer world. They now what’s best for the consumers and come up with the best solution for them. This is why Google is now the top brand in all aspects. Whether you’re excited about Google Glass or even your Android Operating System, Google draws the stick to rule things in a meaningful way. So, when Google released their tablet Nexus 7, the World accepted it as a reward and they kept looking at what Google would bring next. Google didn’t keep them long enough to wait. They released Nexus 7 (2013) to dominate the tablet market again. The people of India might wonder how long would it take for this newer version to reach the Indian market and what this might bring to action. We’re here to answer your questions and regards here. Nexus 7 tablet price in India is around 21,000 INR. There’re three models that have been unleashed in the market. They vary in internal storage and Wi-Fi as well. Let’s take a deeper look at its features and design specs. Google always promises to deliver sleeker design and this time things didn’t change. Although, Google tried to provide cheaper back to its newer nexus but the quality seemed to be perfect. The 7inch tablet comes with upgraded look as well. It features LED backlit IPS LCD capacitive touchscreen with a large resolution of 1200 x 1920 pixels. This is large update than the previous Nexus 7. It comes with clearer screen with higher pixel density (323ppi) as well. The screen comes with the protection of Corning Gorilla Glass as well. The major upgrade lies in the hands of its hardware specifications. Nexus 7 (2013) is featuring Qualcomm Snapdragon S4Pro Quad-Core 1.5 GHz Krait processor (probably making Nexus 7 the fastest tablet in the market) coupled with 2GB RAM. The combination of the two powerhouse results in extreme performance and reliability. If you’re concerned with graphics and gaming performance, you can rest assure all of your worries in Adreno 320 GPU unit (one of the best in the current market). The newer Nexus 7 is faster, smoother and sexier in all senses. It comes with various sensors like Accelerometer, Gyroscrope, Proximiy etc. You’ll find all of the necessary sensors except for Barometer and other ones. It comes with various connectivity functions like Wi-Fi, NFC (Near Field Communication), Bluetooth v4.0 etc. The LTE version is yet not available in the market. If you’ve a LTE version, it would support microSIM and you can expect to get HSPA+ speed in your network. The tablet weighs around 290g which makes it a great bargain for people who want to weigh less. Although, tablets hardly require any powerful camera for taking images, but Nexus 7 hardened itself to match its tough competitors like Apple, Galaxy Note 8.0. It features a 5MP camera with functions like Auto-focus, Face Detection, Geo-Tagging etc. The images are worth of 2592 x 1944 pixels which don’t result in distorted ones when you zoom in. You can expect to shoot 1080p videos at 30frames per second with this device. The secondary camera isn’t bad at all. It’s at least a greater option for video calls and random self-shots. The battery life of newer Nexus 7 is around 3950mAh and it supposed to be supporting your multimedia entertainment options for at least 9 hours which is quite impressive. 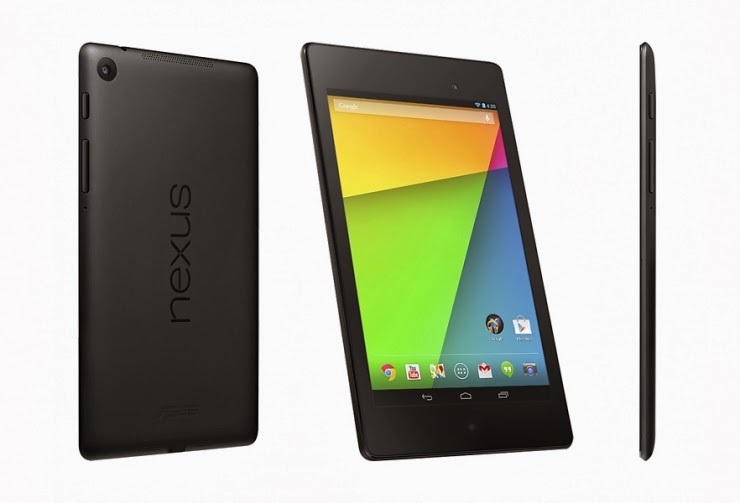 The older Nexus 7 got a large price drop and this made room for the latest version.